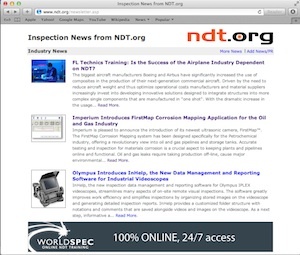 Welcome to the weekly inspection news mailing list from NDT.org. We deliver the latest news and information about the nondestructive testing and inspection industry directly to your inbox every week. Subscribers receive the latest industry news, open positions, available candidates, and new products for the inspection and nondestructive testing industry. See the latest version of the newsletter at http://www.ndt.org/newsletter.asp. To unsubscribe, send an email to ndt-news-request@lists.ndt.org with the word unsubscribe in the subject line. To subscribe to the list, send an email to ndt-news-request@lists.ndt.org with the word subscribe in the subject line. Many people find the web interface to this list much easier to use than the email commands. Everything you can do with email can also be done through the web interface. The home page for this list is http://lists.ndt.org/mailman/listinfo/ndt-news. If at any time you are confused or need help, you can reach a live person by writing to ndt-news-owner@Lists.NDT.org. You may also send an email to ndt-news-request@lists.ndt.org with the word 'help' in the subject line. Contact us at webmaster@ndt.org or visit http://www.ndt.org/category.asp?ObjectID=3884 to find out more about advertising opportunities on NDT e-news.